Michelle Obama is among gay Missouri star Michael Sam's supporters. "You're an inspiration to all of us, @MikeSamFootball. We couldn't be prouder of your courage both on and off the field. 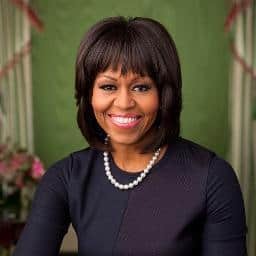 -mo"
Sam replied: "@FLOTUS Thank you for your kind words, humbled by your support." Nowhere did Sam slip further and faster down the rankings than he did at CBS Sports' NFLDraftScout.com, overseen by Rob Rang. He was the 10th-ranked defensive end on Sunday night. On Monday morning, the site had him as the 14th-ranked defensive end. The most noticeable fall came on the overall player rankings at CBS, where Sam went from 90th in the hours after he came out on Sunday night to 160th on Monday morning. 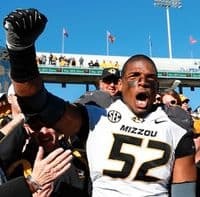 One round or another, Michael Sam's going to the NFL, and like any player, his life off the field will be an afterthought for message boards and comment threads once he establishes himself on the field. The Jackie Robinson comparisons are apt. Michael Sam is breaking down barriers for acceptance and equality. It's new territory for pro football and sports in general. But, sadly, there's nothing new about how he'll be treated by the NFL Draft analysis machine.